I quite like the exotic. Not necessarily strippers or drug dealers; my tastes tend a little more to the gardening and food aspects of the word. Perhaps "adventurous" would be a better term. I like to take chances with USDA borderline plants and unusual foods. 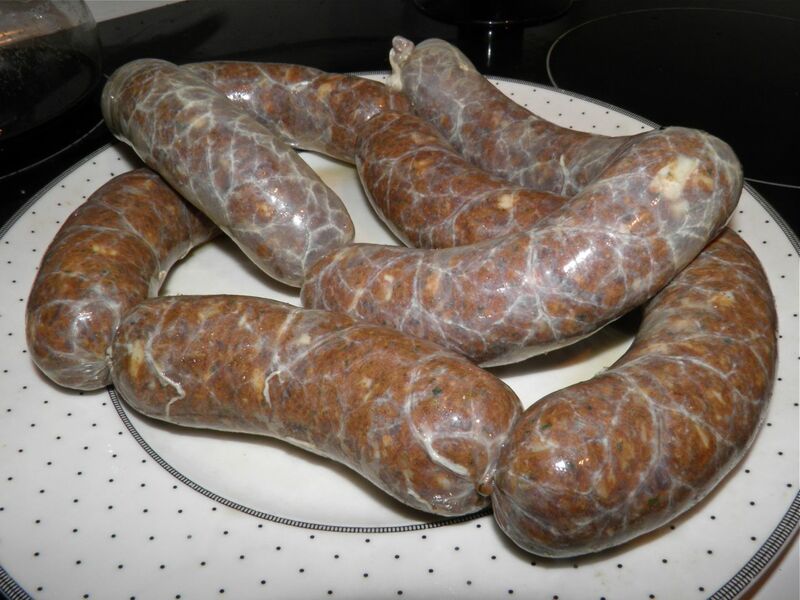 This is my homemade merguez – about 2 lbs. There would be a few unusual culinary items that I couldn’t bring myself to try, but they would be more on the “yuck/gross” side of things. You know, like slugs or grubs, or some weird bottom-dwelling slimy ocean thing. Well, you’re safe with this recipe. although it does have three not entirely usual ingredients. First up is merguez “sausage”. 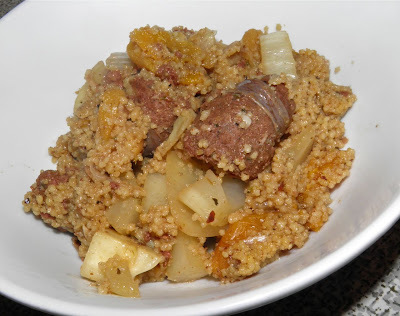 I have sausage in quotes because meguez actually means sausage in Berber language. They are a fairly fiery beef or lamb sausage used in Moroccan cuisine. You can buy them at Pete’s Frootique (I believe) or make your own very easily. 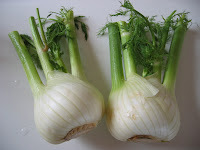 If you want to make your own (highly recommnded), my recipe is here. In today's recipe I have chilli flakes as an option. If the sausage is smokin’ hot spicy, you probably don't need them. I don’t think Pete’s are as spicy as my own. Finally we have sumac. 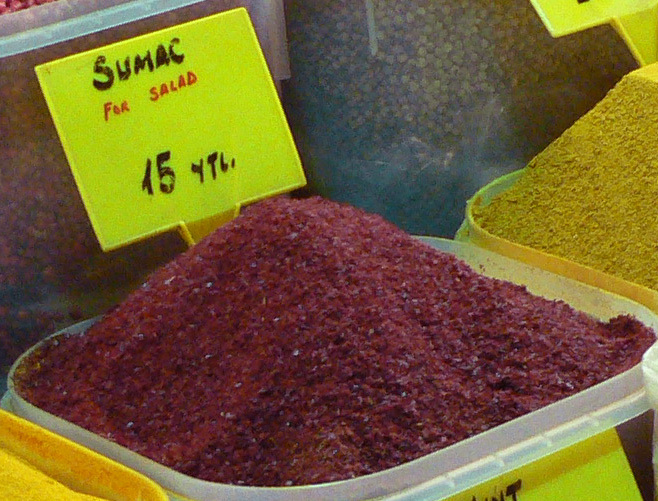 Sumac is a spice that comes from the drupes (the red flower spikes) of the Rhus family of small trees. It is commonly harvested, dried and ground into a powder for use in Middle Eastern cuisine. It has a slight citrusy taste. Some people harvest our native staghorn sumac and make a sort of lemonade from the drupes. I’ve yet to try it, but it sounds interesting. They would have to be washed well with all of our dust we have here in the country. Sumac is becoming quite readily available, so much so that I saw it for sale at the Bulk Barn, our local bulk food store. Previously it was only available at Middle Eastern groceries. This dish uses one of my favourite techniques – one pot cooking. Couple that with a short overall time and you have a double barrelled winner, in my opinion. This was quite an exotic tasting treat, and a great way to introduce some not so common ingredients into my repertoire. 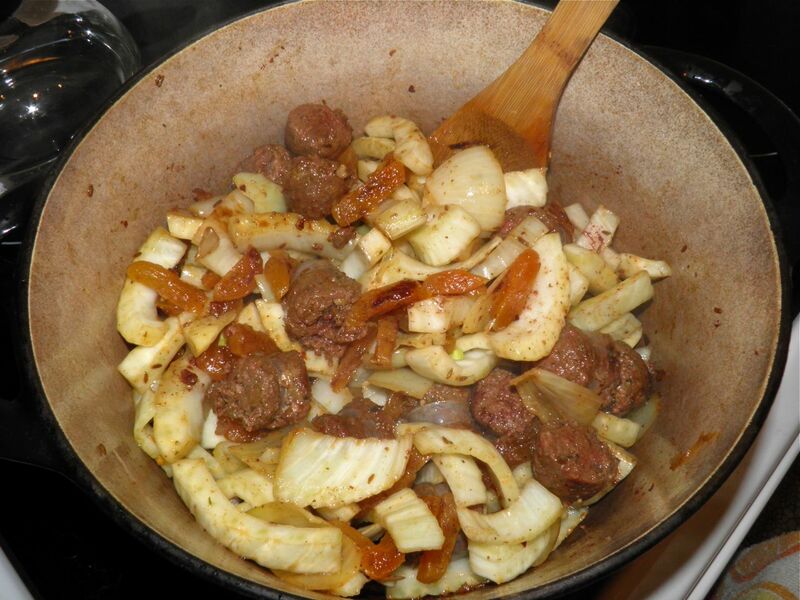 Heat the oil in a Dutch oven or other large pot with a well fitting lid. Add the onion, cumin and chilli flakes, if using. Sauté for 2-3 minutes and then add the sliced sausage and apricots. Cook for an additional 5 minutes. Then add the sliced fennel, oregano and sumac. Sauté for a further 2-3 minutes. Add the chicken stock to the pot and bring to a boil. Then add the couscous and stir everything together well. Cover the pot and let sit for 15 minutes. Fluff and serve.